Five Feet Apart Review – Spotlight Report "The Best Entertainment Website in Oz"
Thanks Roadshow Films for the chance to see ‘Five Feet Apart’ before its national release. This is our review of the movie, but as usual, no matter what we say, we still recommend you to go and see it at your local cinema because there is no better critic than yourself! Five Feet Apart stars Cole Sprouse and Hayley Lu Richardson. It is a teen romance that falls into the ‘sick lit’ genre as it centres on two teens who find love whilst struggling with a life threatening disease. Stella (Hayley Lu Richardson) is a 17-year-old who suffers from cystic fibrosis. She spends most of her time in hospital. Stella meets Will, a teenager who is also suffering from the same illness. Due to the high risk of cross infection Stella and Will must be 6 feet apart at all times. Although unable to touch they manage to form a close bond. Five Feet Apart isn’t the worst teen film out. Richardson and Sprouse are charismatic onscreen and they share a natural chemistry. Richardson’s character succeeds in having a balance of lightness and positivity, whilst providing depth and emotion to the film’s darker moments. She carries the emotional weight of the film. 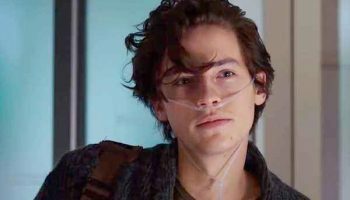 Five Feet Apart succeeds in showing the day to day life struggles of someone living with cystic fibrosis. Stella and Will’s close bonds with fellow patients, doctors and nurses is a nice addition to the story. Five Feet Apart plays into the usual romantic cliché’s and tropes, not providing anything new to the “teen love drama” genre. The film’s third act really amps up the melodrama as some intense moments were laughable due to their unrealistic nature. Five Feet Apart is perfect if you love a romantic teen drama and want to have a bit of a cry at the cinema with your friends. Five Feet Apart is filled with melodrama and over the top gestures of love which are perfect for the films target audience. Five Feet Apart – In Cinemas Now!